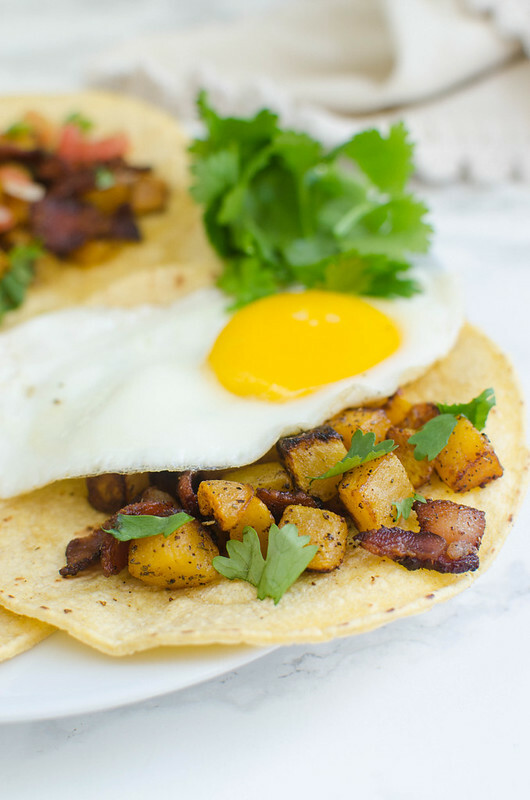 Bacon and Butternut Squash Breakfast Tacos – the best fall breakfast! Corn tortillas filled with bacon and butternut squash. Top with an egg, salsa, and fresh cilantro! 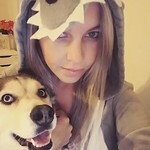 Can I tell you about the first time I ever got a mean comment on this blog? It was my Ranch Mac and Cheese from 2010 because yes, I have been blogging my entire life. And the comment was from a man, along the lines of Italian grandmother’s rolling over in their graves. So I called my then husband in tears because omg, I had offended someone with my mac and cheese. And should I just take the post down? Should I respond to the guy and apologize? Should I just leave the internet forever? But yeah, I’m telling you this because I still brace myself any time I take a classic food and make it a little weird because of that one jerk that decided to leave a nasty comment 7 years ago. Y’all don’t even want to know the comments I got after those Cubano Tacos. 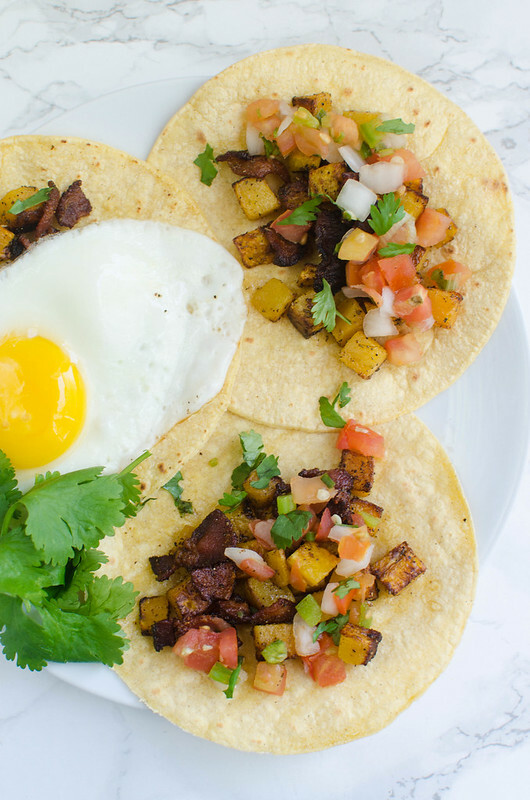 So uhhh, go easy on me with these Bacon and Butternut Squash Breakfast Tacos. I got super into breakfast tacos when we moved to Texas. They’re like a thing in Texas. And I know breakfast tacos are thing everywhere but they’re a thing here. But also? 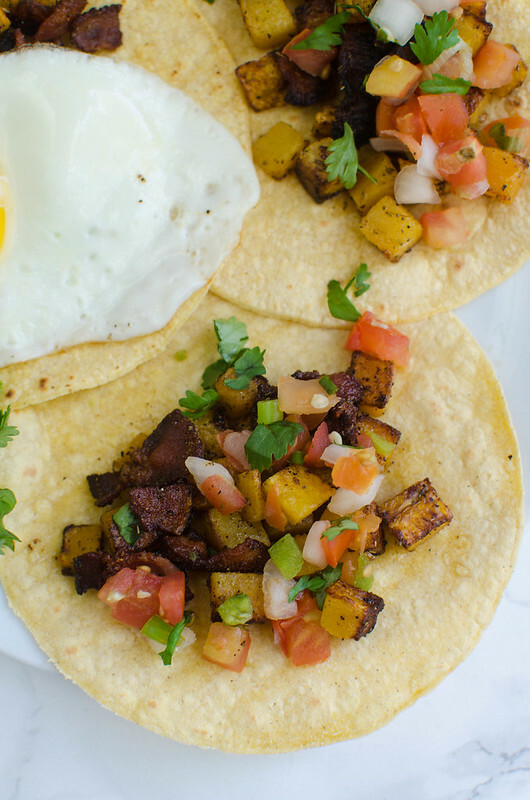 There aren’t a ton of options when it comes to breakfast tacos. Most places just have meat, potato, or bean. 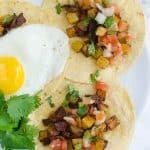 Bacon and Butternut Squash Breakfast Tacos! This recipe is everything I love. Corn tortillas, bacon, butternut squash, and sage. I’d be happy with just that but for the purpose of this post, I added eggs and pico de gallo. It’s super quick – just cook the bacon and then cook the squash in the bacon grease. Add the seasonings and warm the tortillas while everything cooks together and you’re done. Cook an egg if you want. Add some salsa. Cover them in sriracha. Enjoy them however you want. They’re delicious and if you follow my Instagram Stories, you know that I’ve made them probably 6 times in the last 2 weeks. Butternut Squash and Black Bean Enchiladas – easy and delicious meatless dinner. They’re spicy with just a hint of sweetness from the squash. Roasted Butternut Squash and Goat Cheese Dip – the perfect dip for a fall party! Butternut Squash and Crab Bisque – Whole Foods copycat recipe! Creamy butternut squash soup with fresh crab mixed in! In a large skillet over medium-high heat, cook bacon and almost cooked through. Add squash, onion, and sage; lower heat to medium. Cover and cook, stirring occassionally, until squash is tender, about 5 minutes. Add garlic and black pepper and cook just until garlic is fragrant, about 30 seconds. Divide the mixture over the corn tortillas and top as desired.